Does NOT FIT coil SIDING nailers. 1-3/4 in. 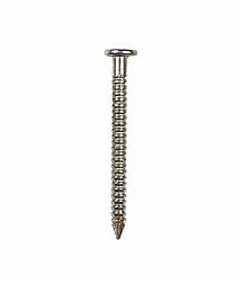 Hot Dipped Roofing Nails, Ring Shank, Bulk. Made in USA. 5 LB/Box. 6 Boxes/Carton. Price/Carton (30 Lb total, about 4290 nails). 1-3/4 in. 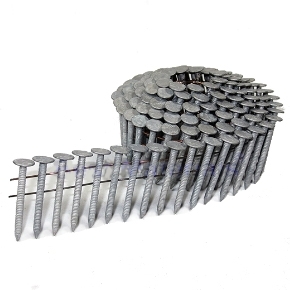 Hot Dipped Roofing Nails, Ring Shank, Bulk. Made in USA. 50 LB/Box.. Price/Box (about 7150 nails). 1-3/4 length x .120 inch 304 Stainless Steel, RING Shank, Coil Roofing Nails, Wire Collated, 120/Coil, 30 Coils/Box. 3600/Box. Price/Box.